My Little Patch of Sunshine: Tell Me Thursday - almost 12 years ago! Yes, that was a photo from my wedding day that I posted yesterday. It is one of my favorite pictures of the day, and the only one we had blown up to a larger size. Yes, he's wearing work boots. We met online 14 years ago. (I placed an ad in the Romance section of AOL. He answered.) When we first talked on the phone to set a date, he mentioned that he was a contractor and I assumed that all contractors wore work boots. I had a thing for a guy in work boots, so this was a good thing! Well, I was smitten on that first date, but I also found out that he didn't even OWN a pair of work boots! I think I bought him a pair for our first Christmas, or maybe his birthday. He didn't wear them for work, but they were a bit of an inside joke for us. 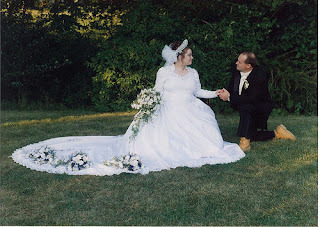 On our wedding day (8/8/97), he wore those work boots down the aisle! Dear Fr. Kevin was not impressed and very concerned about my reaction when I would see them. Bo assured him that I knew, and I was okay with it. So, that's the story! If you played Wordless Wednesday, be sure to follow it up today with Tell Me Thursday! What a gorgeous picture and LOVE the boots! That is just the most adorable story. Y'all are so cute! Fr. Kevin had no sense of humor. I had sort of forgotten about him. About the work boots, I think that the carpenter who did most of the work on our kitchen wore Nikes every day... I bet the work boots were more comfortable for the wedding than the shoes that usually come with a rental tuxedo though. What a sweet story. My husband and I celebrated out 12 year anniversary in June! Happy Anniversary. What a sweet story! Happy anniversary! The picture is beautiful! My Tell Me Thursday is here. What a beautifully staged photo with the flowers and the greenery outside. I love the story of the work boots and it was a nice touch for the wedding.